What good is an endless jukebox in the sky if you can only listen to it while you are sitting in front of your computer? Imeem answers that with what is certainly the best Android app I’ve seen (or heard) so far. It’s called imeem Mobile, and it is the musically-oriented social network’s first foray into the mobile arena. Caveat: I’ve had a review phone for about a week, and only now are a bunch of new apps flooding onto the Android market in anticipation of T-Mobile’s G1 going on sale on Wednesday. So this is an early favorite that could be eclipsed by better apps down the road. But, just to compare, MySpace is also launching a mobile app for Android tonight, and that doesn’t even include any streaming music. We look at what the most popular songs are across imeem, and in real time populate them to be available on mobile. The catalog is a literal representation of what the community finds most interesting at different times. So the songs available change daily as tastes change. You can search for specific artists (I had no trouble finding songs from a wide spectrum of artists including David Bowie, the Beastie Boys, Vampire Weekend, and Serge Gainsbourg, for instance). 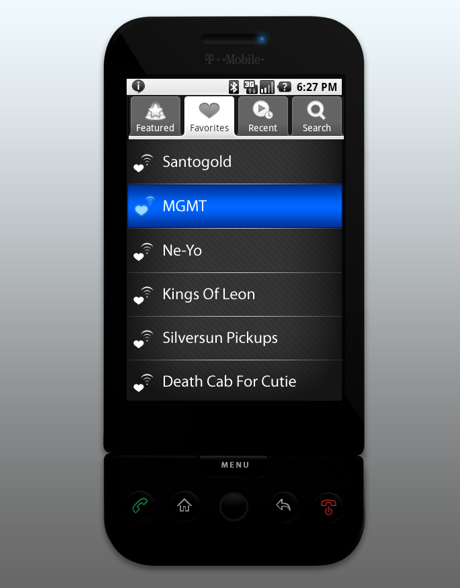 Or you can just pick one artist and let imeem create a playlist of related songs that it streams radio-style. Each song can be favorited, blocked, paused, or bought on Amazon’s MP3 store (which downloads the MP3 straight to the phone’s music library). You can also skip to the next song. The recommendation engine works without a hitch if you start out with the right artist. I’m listening to it right now, and it is just as good as Pandora, which is saying a lot. The streaming quality over Wifi sounds just as good as my iPod (the 3G in my apartment is more spotty). The app creates a station around each of your favorite artists, keeps a history of recent artists you’ve listened to, and lets you create a station based on your favorites and related artists. It also offers a Top 100 station base don the most popular songs on imeem, a Spotlight station where imeem promotes new acts, and a Discover station based purely on imeem’s personalized recommendations. 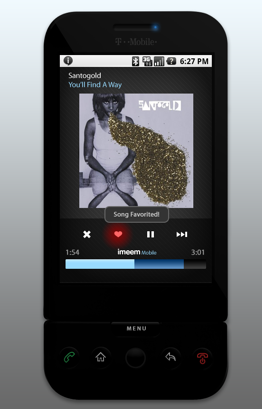 Every song you listen to or add as a favorite on imeem Mobile is reflected in your media tracker on the Website proper, and vice versa. So as you listen to songs while at your desktop, every artist you mark as a favorite will be available to you when you walk out the door with your Android phone. We didn’t get the feature that enables access to your playlists on the phone into the final shipping build for this launch, but it is obviously something the imeem mobile app should do. It should also give you access to your friend’s playlists and the option of building stations around their favorites. And the search feature could be improved. All in good time. But imeem Mobile is a clear example of how software that taps into the vast resources of the Web (in this case, a virtually limitless music database and the smarts that come from watching social interactions on a grand scale) can turn an Android phone into a real game-changer. Instead of 10,000 songs in your pocket, now you can have one million.